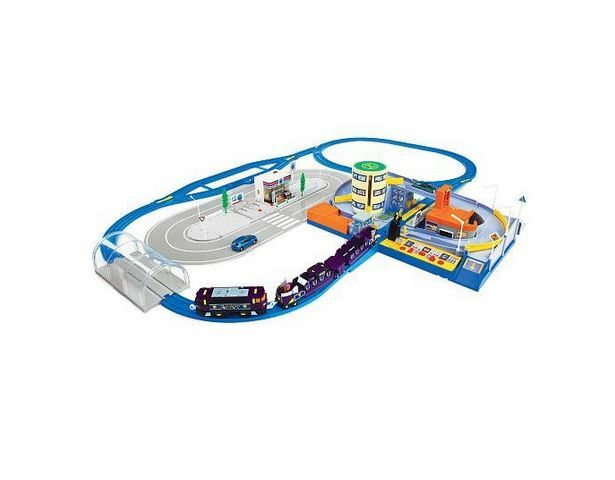 Make your kids use their imaginations while playing with the Tomica Mega Station Hypercity Set. Their imaginations will be running wild when they get this set which is one of the top toys for Christmas 2018. If you have kids who love to play with cars and train sets, this is gonna bring loads of fun and excitement to them. This can make every Tomica fan roar with delight especially when they found out about the moving parts and fully automated train. Let your little engineer experience the opportunity of becoming Stationmaster of this bustling Tomica city train station. Here, they will be able to see the activities that happen in the station and experience the responsibilities a real stationmaster has. If you want to encourage your children to play with their imagination, then this playset definitely fits the bill. They can use the accessories to customize their own Hypercity with the trees, lamp posts, and parking spaces. They can watch as the train pulls into the terminal and unloads its passengers and how the cars stop to let the it pass by the crossing. The cars automatically stop when they see the locomotive approaching so that there would be no accidents and the train continues to its destination. When they are tired of just watching and want hands-on play, they can switch everything to manual and control the working train station. They will have to watch over the cars and train. In addition to that, there is a convenience store that brings extra fun with its Tomikid figure. They can use their creativity and planning skills. Since it includes small parts, its recommended age range is 4 years and above. Kids will definitely love the moving and bustling railway station that mimics real-life situations. If your child already has a collection of Tomica toys, then this item is a valuable addition to that. This playset is an excellent replica of a real station with its shops and accessories. There are schedules to keep to and traffic to manage, so as the Stationmaster, your kid will have some responsibilities to carry out here. Get 4 “C” batteries to make this work though because these are not included with the set. This will be your kid’s most favorite transport playset along with the LEGO City Public Transport Set 8404. The Mega Station Hypercity Set has received numerous gushing reviews from satisfied customers, or should we say, satisfied customers’ parents. Those who have bought the playset for their children are delighted to report on how well made it is. Something that has the reviewers divided is the size of the toy set. Some people report their children being in love with how massive the playset is, while some parents lament just how much space it takes up in the house. Almost everyone agrees on how great this is as a Christmas present, with many having bought it themselves as such. Kids of all ages seem to find something to love about this. Whether it’s how fast the trains can go, or the fact that you can turn it on and off with just one switch, or even the incredible fact that the cars will stop at railroad crossings when they detect the train incoming – a great little feature that’s caught many people’s eyes! The only gripe that some people seem to have with the item is that some of its parts are actually made of cardboard, which they think means it won’t stand up to the hours of rough play that it’s expected it will go through. However, there are reassuring reviews of people reporting that even after years of play, the playset has remained nice and intact. Last but not least, purchasers loved the price of the toy, which they found to be quite reasonable for a playset of this size. Everyone also agrees that it is well worth it given how much play time the little ones in your life will get out of it.